Finally we come to issue #42, which seems an appropriate occasion to come clean and confess that we are not really The Funding Crowd, but merely A Funding Crowd. Didn't you hear that we come in six-packs? But DON'T PANIC. No matter who we are, we're here again to guide you through the immensity of the crowdfunding worlds and to show you the marvels of the most interesting projects for Linux games. So relax, take a sip of a Pan Galactic Gargle Blaster, and start reading! 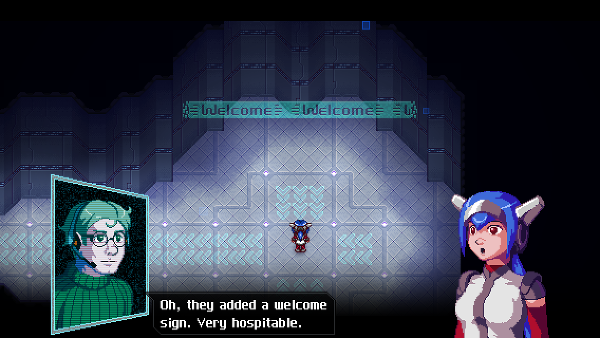 A project that looks like it could be a surprising success is the retro-inspired 2D Action RPG CrossCode. With a very ambitious goal of €80k, it hardly seemed doable at first. Less than a week into their campaign, creators Radical Fish Games have managed to rake in a respectable €15k, and they still have well over three weeks to go. Whether they'll make it is still highly uncertain of course, but it's always nice to see an underdog make it. And this is a game that looks promising. The game was previously featured in an article on GOL when a browser version of the demo was made available. It is a game built around the mechanic of throwing balls, not unlike the Brockian Ultra Cricket, which you use both to fight and to solve puzzles. The protagonist of the game is the mute Lea, who has lost her memory and is stuck in a fictional MMO of the distant future. Her only hope to regain her memory is to play the game. The game is divided into story, puzzle and exploration modes, and judging by the demo, they all seem well fleshed out. Pledging €15 will give you both a DRM free build and a Steam key on release. The €25 also gives beta tester access, but what this means for a Linux backer seems uncertain, since they so far have given little info on when to expect the Linux version, other than that it will be ready before the final release. 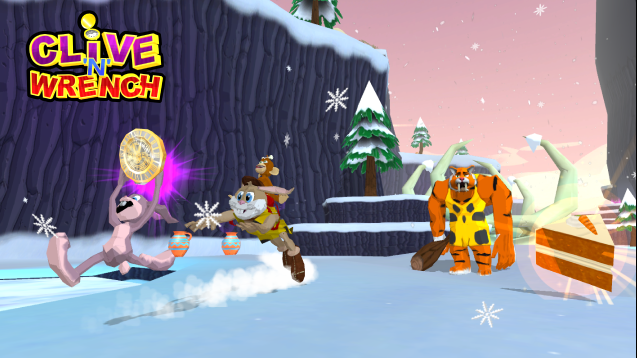 3D collect-a-thon platformer Clive & The Stones of the Ancient Bunnies makes a return to Kickstarter, but this time under the new and snappier name Clive 'n' Wrench. The goal is unchanged from their last run, but they've already made more progress towards the £25k with over twice as many backers and more than twice as much pledged. That said, they still have far to go, as they are still well short of £5k with less than three weeks left of the project. Take the Money... and Run! The game is inspired by 3D platformers of the late 90s and early 00s, like Banjo-Kazooie, Spyro the Dragon, and Jak and Daxter. Clive 'n' Wrench has you controlling the titular dual protagonists as they race through 10 different time periods to collect watches and ancient stones to stop the evil Dr. Daucus from taking over the world with his mutant army (and probably force-reading Vogon poetry to everybody too). The game will be stuffed with collectibles, enemies and mini-games and promises a solid dose of the kind of 3D platforming that has been sorely missing for the last decade. For a £10 pledge you'll get a digital download of the game once it's released. A £40 pledge puts your name in the credits, while a pledge of £60 or more scores you a t-shirt. The game could also use some help on Steam Greenlight, and even if it doesn't end up getting funded this round either, I don't think we've seen the last of this game, as the creator seems determined to finish it. Don't Be Patchman is an action adventure game involving stealth, combat, puzzles and exploration. You play as Patchman, who is a prominent figure among the mostly harmless people the Sheeple. Drones arrive and subversively enslave the Sheeple, no small thanks to your oblivious protagonist, but as the game begins, you get a chance to redeem yourself by overthrowing the Drones. To do so you must grow and eat plants to gain abilities and to use both as weapons against the drones and to free your people. The Sheeple are being subjected to propaganda that makes them only want food from vending machines provided by the Drones, and in order to break the spell you need to destroy the proganda and provide the Sheeple with a healthy alternative. The Drones of course want none of this and they will do their best to destroy both you and your produce on sight, so in order to succeed you'll have to fight the Drones when possible, and otherwise stay out of sight. 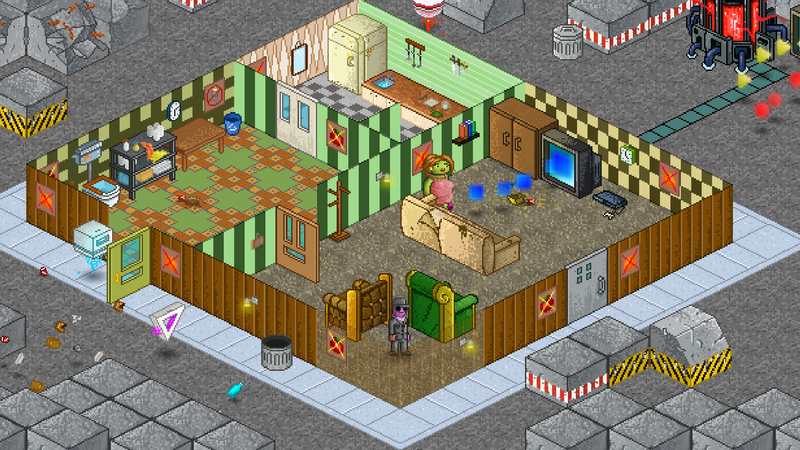 Our antihero Patchman in his isometric world. The developers, Naturally Intelligent, are asking for $25kCAD to make this project become a reality. They're already past $5kCAD, but still have a long way to go to reach their goal before the campaign ends in a little over three weeks. If you want to help, you can do so by pledging $10CAD for a copy once it's released. If you have more money to spare, the tiers above offer interesting things like a hackable version of the game and exclusive in-game content. There's also a Steam Greenlight page for the game where you can vote if you want to be able to play the game on Steam when it's done. What do you get when you cross the classic video game The Oregon Trail with Star Trek? Probably something not quite unlike Orion Trail. Be a starship captain and keep all most some of your crew alive while the galaxy throws weird things at you. Be it warp weasels, alien banquets or jungles on mysterious planets, every encounter has a variety of decisions that can change based on your current situation and crew. 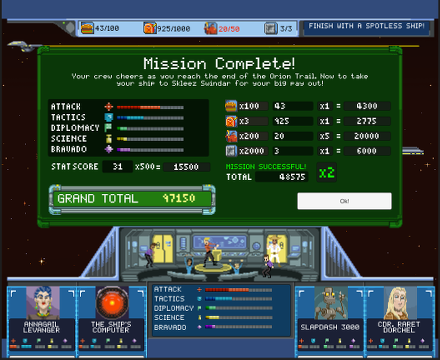 In turn, each decision you make will influence your resources, such as food, fuel and phaser fodder crew. And yes, things will go wrong. Horribly wrong. For the universe is a vast, strange and frankly quite dangerous place. You're more likely to get eaten by the Ravenous Bugblatter Beast of Traal than to live long and prosper. But would we want it any other way? The victory screen, a truly rare sight. The fee of entry for the game is a mere $10, but $20 will also get you the SID-alicious soundtrack by Rainbow Kitten. Other rewards include the naming of crew and red/blue/gold shirts. They're still missing nearly half of their $90k goal, but that should be manageable in 10 days, right? From a game about space faring to a game taking place on a dying planet after the collapse of a space faring civilisation, long forgotten even by the Encyclopaedia Galactica. Tahira: Echoes of the Astral Empire lets you play as the titular Tahira, a reluctant princess of the descendants of a colony on a forgotten outpost world. The planet is growing more inhospitable by the year, a vast army threatening to crush your people is gathering and now you, the sole heir to the throne, need to make a stand. Taking cues from both western RPGs like BioWare's games and eastern RPGs like Final Fantasy Tactics and Fire Emblem, Tahira is a story-driven RPG with tactical round-based combat. Converse with people to gain allies and influence the story. Travel and explore the world to learn more about its current denizens, and maybe unravel the history of the long-gone space farers. During combat, take control of different units and allies, leveraging their unique skills to gain victory. Graphically, the game features beautifully rotoscoped animations, giving it a realistic, but hand-drawn appeal. The design and setting are influenced by travels through Asia and the Middle East, and the music (by composer Max LL) too mirrors the sounds and cultures of these regions. To deepen the atmosphere, the two stretch goals they've picked out would improve the soundtrack through orchestration and added voiced dialogues. One word of "warning", though: this will be an episodic game, and most of the work has gone into the first episode alone. This crowdfunding campaign only covers that first episode, as they don't want to promise more than they can deliver. Currently, with 17 days to go, they've managed to get a bit more than a third of their $68kAUD goal. $10AUD gets you the first episode, $25AUD the episode plus the soundtrack, a digital art book and a high-resolution copy of the world map. Who says pixel graphics are ugly and belong to the past? Someone who has never heard of Slain!, surely. It's Wolf Brew Games' first creation, and though it's admittedly heavily influenced by hack-n-slash classics from the 80s and the 90s like Altered Beast, Ghosts 'n Goblins, or Shadow of the Beast, it sports stunningly atmospheric graphics and enough gore to satisfy your darkest desires. It's set in a gothic world where dark forces have seized seven great towers, each one guarded by an army of nasty creatures and a mighty overlord. Bathoryn, the lycanthropic hero, will set forward to conquer the towers and liberate them from their evil occupants. and about to die of dismemberment that I really wish I'd listened to what my mother told me when I was young. The game is split up into seven areas, as you could have guessed, but each one is in turn divided into two different sections. The first one covers the approach to the tower in a horizontal side-scrolling fashion, is mainly focused on combat, and has a mini-boss at the end. The second one is the proper ascension (or descent) of the tower, and there the focus changes towards platforming and puzzles. The grand finale for each tower is of course the battle against its overlord. The gameplay retains a basic characteristic of the classics of yore, and that is its brutal and unforgiving difficulty, both in the combat and in the platforming involved, so this is probably not a game for the faint of heart or for rage-quitters. The entry fee to secure a copy of Slain! (both a DRM-free download and a Steam key), plus your name in the credits and a wallpaper, is set at $15. It's certainly a sure bet, as it currently sits at the 75% funding mark with more than 3 weeks to go. But we haven't told you the best part yet: we almost won't have to wait until its release, which is set for May 2015, a mere two months! Now, please follow us to page 2 if you want to learn the fate of last issue's picks and discover our new Biggie favourites! Pledged for Tahira a few days ago, while I've been ignoring kickstarter for a while (still waiting for 11 games... although fortunately all projects are close to delivery or are improving well) the game attracted my interest with the attention to details the devs are showing, and considering the advanced state of the project the risk feels minimal as well. I don't really like episodic approach either but the first episode is expected to be 4-5 of gameplay that is not that bad considering basic pledge is only $10AUD, about half the usual starting kickstarter pledge for about half of the game. I really need to play the first Shadowrun game still, it's been sitting in my library for ages now. The games look really great, so hopefully I will have played the other two before this one is released. Segata Sanshiro I really need to play the first Shadowrun game still, it's been sitting in my library for ages now. The games look really great, so hopefully I will have played the other two before this one is released. Don't bother with the first game; it's mediocre. Dragonfall is a million times better, so just skip right to dragonfall. Here's one that slipped by me that looks interesting but seems very unlikely to get funded at this point: Sneaky Ninja, a stealth/action platformer, inspired by games like Mario and Mark of the Ninja (and supposedly Thief and Dishonoured, though I don't see any similarities there). It has already been greenlit on Steam, but they're less than half of the way to their $10K goal on Kickstarter with a little over a week to go. I think we ended up skipping it since it was covered in a separate article by BTRE. You're right, that's it. We discussed the issue, and don't know why but in the end I was left with the impression that we really included it in a TFC article.